Most pet owners are diligent about feeding their pets a healthy, nutritious diet. 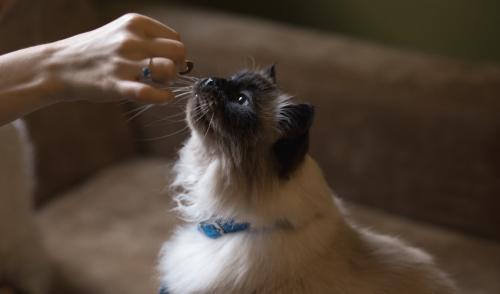 It can be tempting, however, to offer a pet a tasty treat, especially on a special day such as a holiday or the pet's birthday, or even as a reward for mastering a new trick or obeying a command. There are some foods, however, that can be toxic to pets and should never be offered, even in small quantities. Toxic foods can lead to failure of the liver, kidneys or pancreas, as well as digestive upset and other health problems. In severe cases or with the most dangerously toxic foods, symptoms can happen very quickly and more dangerous reactions, including seizures, coma or death, could happen rapidly if veterinary treatment is not sought immediately. If you suspect your pet has ingested anything potentially toxic or any toxicity symptoms are evident, seek emergency veterinary care right away. There are many common, familiar foods that can be surprisingly toxic to pets. While these foods may be healthy for humans and could be widespread in many different dishes, it is important to keep them away from animals. This includes being aware of ingredients in seemingly harmless foods to be sure they do not contain anything dangerous to pets, such as chocolate chips in banana bread, excess fat and salt in gravy or garlic and onions in stuffing. While some of these foods are more toxic than others, all of them can cause discomfort or more severe complications for different pets. This list is not a complete inventory of potentially toxic foods, however, and pet owners should carefully check the suitability of any new foods for their pets, including ingredient lists and veterinary recommendations. Because toxic foods can quickly become dangerous for pets, even with just a bite or two, it is always best to keep these foods away from animals to avoid accidental ingestion. Store foods on high shelves out of reach of pets, bearing in mind that pets may jump onto counters or climb to reach higher areas. Consider attaching safety latches to cupboards or fridge doors to thwart sly pets that have learned to open those doors and access dangerous foods. Do not leave dangerous foods in snack bowls, candy dishes or serving trays that give easy access to foraging pets. Clean up food spills right away without allowing sneaky pets to take advantage of the forbidden food source. Do not allow pets to clean up human dishes after a meal, and be sure all food residue is safely stowed in a secure trash can pets can't open. Secure lids on outdoor trash cans and keep them out of reach of pets to avoid any unauthorized foraging through leftovers and discards. Alert all family members and visitors about dangerous foods so they are not tempted to offer a pet a potentially toxic treat. The best diet you can offer any pet is one that is safe and nutritious for their dietary needs. Avoiding toxic foods should always be a priority when preparing meals or offering treats to your animal friends, and with care, your pets can enjoy a safe, healthy diet and delicious treats.